By Feder, Stuart; Karmel, Richard L.; Pollack, George H., Eds. Madison, Conn.: International Universities Press, 1990. xvii, 525 pp. Some wear, tears, and soiling to dust jacket, else very good overall. Inscription to previous owner on ffep. Contents: On the enjoyment of listening to music (1950)/Heinz Kohut and Siegmund Levarie; Observations on the psychological functions of music (1957) Heinz Kohut; Some considerations of a psycholanalytic interpretation of music (1971)/Martin L. Nass; Freud's theory of jokes and the linear-analytic approach to music: a few points in common (1979)/Daniel Sabbeth; The development of musical ability (1968)/Pinchas Noy; Transitional tunes and musical development (1970)/Marjorie McDonald; A psychoanalyst's view of Clara Schumann (1968)/Anna M. Burton; Charles and George Ives: the veneration of boyhood (1981)/Stuart Feder. 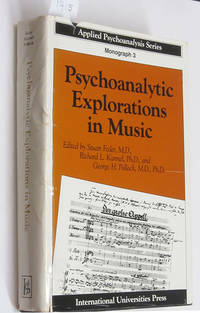 On hearing and inspiration in the composition of music (1975)/Martin L. Nass; Mourning and memorialization through music (1975)/George Pollock; From creation in art: an ego psychological approach to creativity (1979)/Pinchas Noy; The nostalgia of Charles Ives: an essay in affects and music (1981)/Stuart Feder; The development of creative imagination in composers (1984)/Martin L. Nass; On Beethoven's deafness (1978)/Maynard Solomon; Johannes Brahms: music, loneliness, and altruism (1985)/Peter Ostwald; Mourning through music: Gustav Mahler (1974)/George Pollock; Gustav Mahler: the music of fratricide (1981)/Stuart Feder. Mozart: a study in genius (1951)/Aaron H. Esman; Mozart's Zoroastran riddles (1985)/Maynard Solomon; Rossini: a psychoanalytic approach to "The great renunciation" (1965)/Daniel W. Schwartz; Robert Schumann and Clara Wieck: a creative partnership (1985)/Anna M. Burton; On falling in love: the mystery of Tristan and Isolde (1986)/Richard D. Chessick. Applied Pschoanalysis Series, Monograph Vol. 3.